Button is barely visible behind the pivot pin. 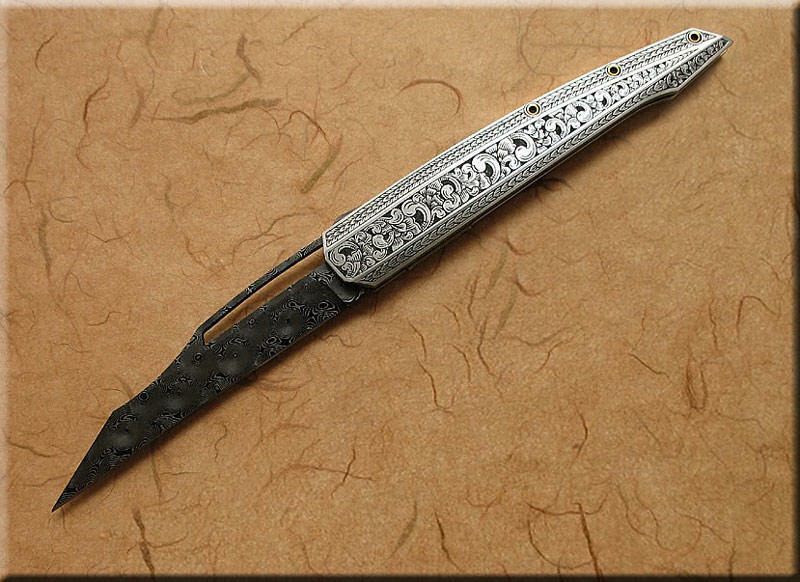 Fireball Shard, 2-tone flame engraving on Hot blued c1045 frames, Rados Maiden Hair Damascus blade, 24kt. gold plated fittings, $3150.00 sold. 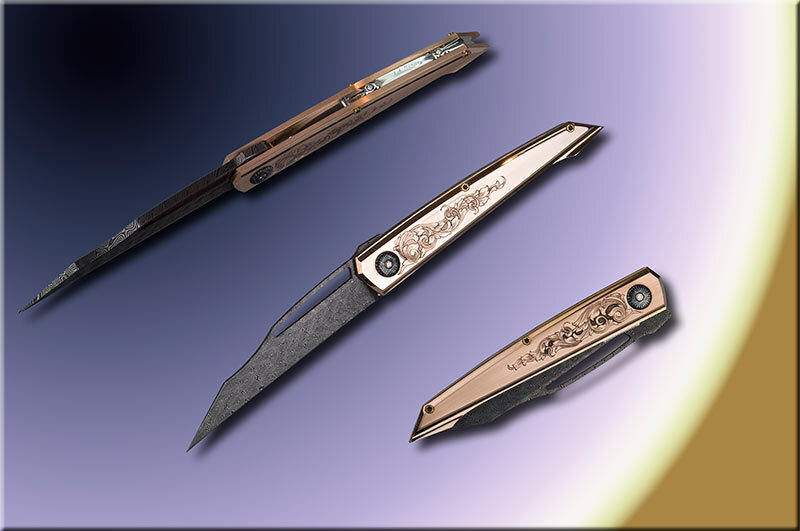 Shard, 2-tone "Daimonds" engraving on Hot blued c1045 frames, 4" Devon Thomas Damascus 24kt. 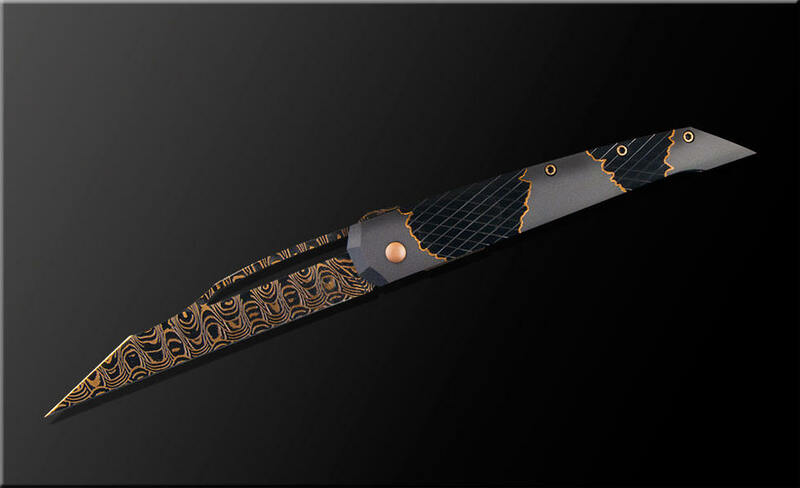 gold plated blade, 24kt. gold wire inlays. $3350.00 sold. Shard, 2-tone "Bricks" engraving on Hot blued c1045 frames, 4" Devon Thomas Damascus 24kt. 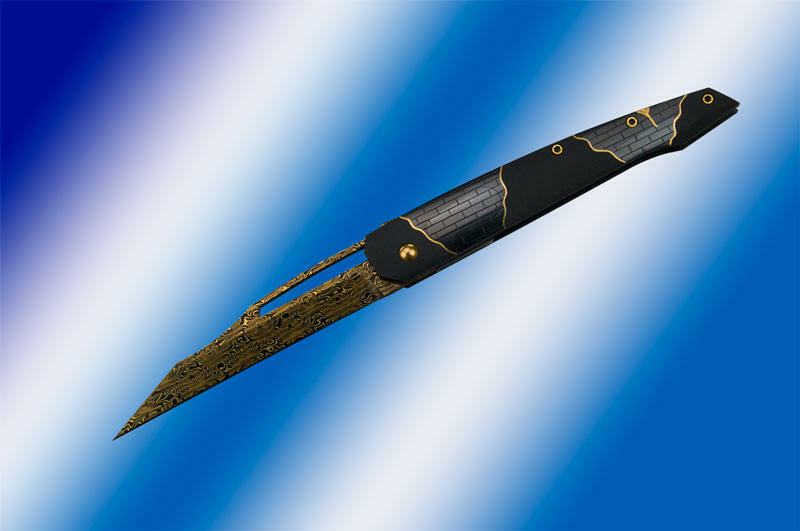 gold plated blade, 24kt. gold wire inlays. $3350.00 sold. The shard is available in Mini version (shown below) as well as the original full sized version. 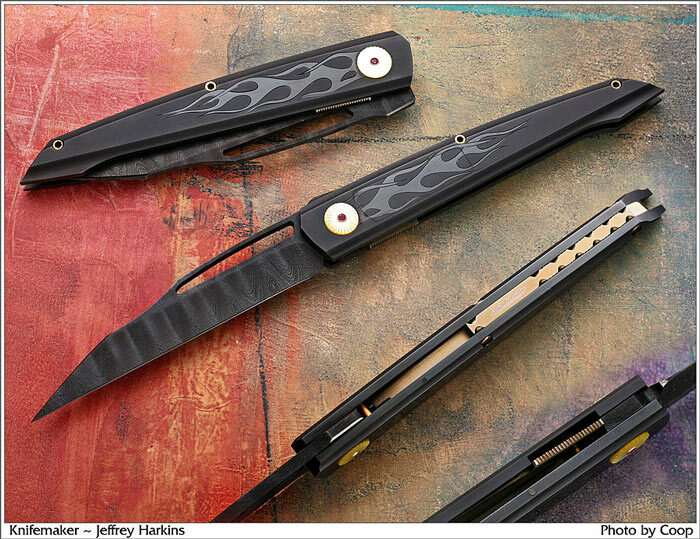 the Mini has a 3.2" blade, The large model has a 4" blade. 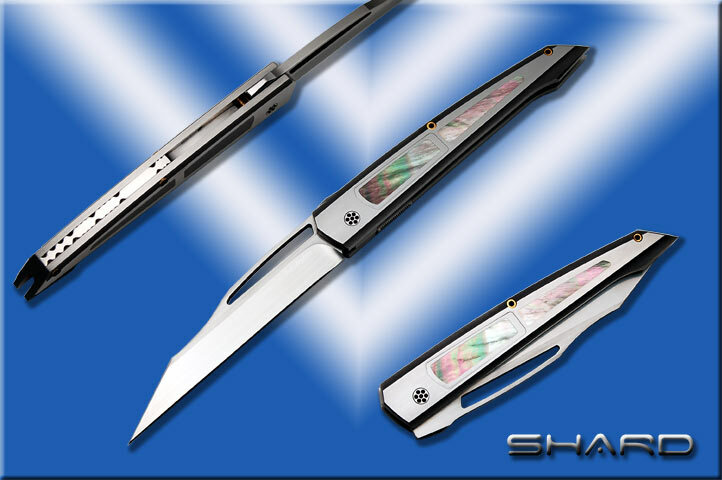 Mini-Shard D/A 416ss frames with black lip pearl inlays, first inlay is the button. $2500. sold. 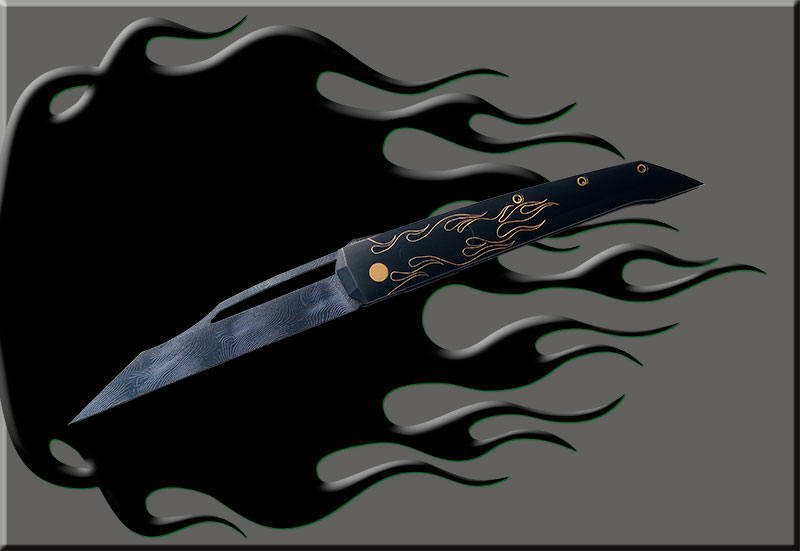 Fireball Shard, 2-tone flame engraving on Hot blued c1045 frames, Rados ladder Damascus blade, 24kt. gold plated fittings, fluted pearl and rubies for pivot caps. $3000.00 sold.